Trees which are deficient in N have small, pale green leaves, which may drop early. In extreme deficiency, the whole leaf turns yellow. There is less vigorous vegetative growth and yields are reduced [N20]. Similar symptoms are caused by Phytophthera root rot and lack of oxygen to the roots in waterlogged soils, so suspected N deficiency should be confirmed by leaf analysis [N4]. N deficient trees are also more susceptible to freeze damage [N34]. N deficient "Jalna" avocado leaf. Normal leaf is on the right. Photo by Bob Platt, courtesy of Avocado Source. 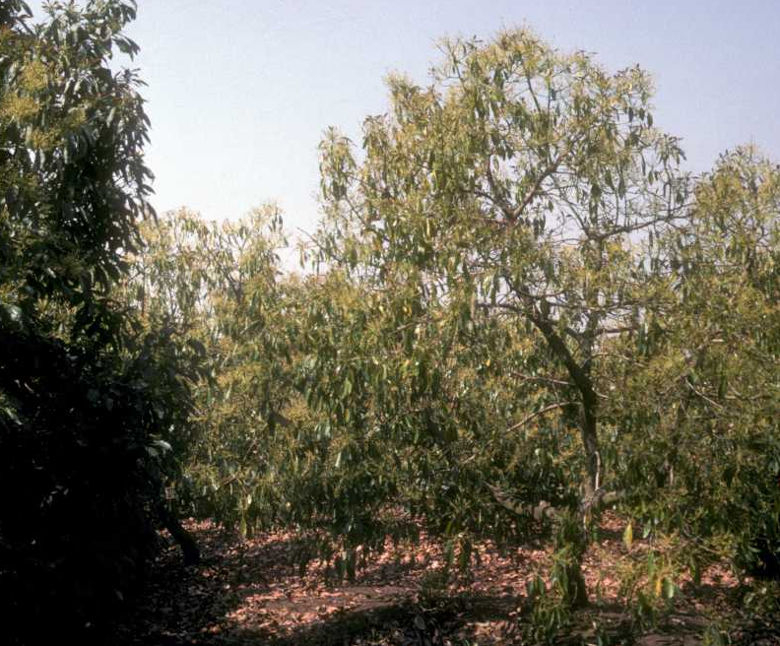 Pale, narrow leaves, reduced shoot growth and premature defoliation on an N-deficient avocado tree. Photo by E.Lahav, courtesy of Avocado Source. Trees receiving excess N have large dark green leaves and abundant vegetative growth, which can host larger insect populations [N11]. Yields and fruit size may be reduced in some varieties [N3,N7,N20]. Excess N may also contribute to postharvest flesh discoloration [N2]. Soil nitrate analyses are less common in orchards than in annual crops [N10]. However, soil nitrate analyses can provide information for the fine-tuning of the fertilization program. Interpretation of the results is most informative when samples are taken from the same blocks used for leaf analysis. Blocks should be uniform with respect to soil properties, tree appearance, age, variety, and rootstock. Nutrient availability is generally determined in the top two feet of the profile, which is the zone where most of the fibrous roots are located [N28,N33] . Samples need to be kept cool and analyzed as quickly as possible to minimize N mineralization before analysis. For more information on sampling procedure see Soil Sampling in Orchards. Soil nitrate-N present in spring contributes to the tree's N nutrition. One ppm of NO3-N per foot of soil corresponds roughly to 3.5-4 lbs N/acre. For example, a NO3-N concentration of 5 ppm in the top foot of the profile corresponds to 17-20 lbs N/acre. The N application rate should be adjusted for high residual nitrate concentrations in spring. High soil nitrate concentrations in late fall may be the result of excess N fertilizer applications during the growing season. Nitrate in the soil profile in fall is prone to leaching during the winter. High NO3-N concentrations below the top two feet of soil indicate that in addition to N, irrigation rates were also in excess of plant demand. If large, divide the orchard into uniform blocks (uniform with respect to irrigation block, soil properties, tree appearance, age, variety, and rootstock) and sample each block separately. Sample leaves from non-fruiting, non-flushing branches, less than 6 feet above the ground. Sample the youngest fully expanded leaves from the spring flush (5-7 months old). Take one leaf from each quadrant of a tree. Sample each block in a diagonal or U-shaped pattern. Unusual or poorly-performing trees or groves should be sampled separately. Take at least 40 leaves from each block or grove. Place samples in a clean paper or porous cloth bag. Have samples analyzed without delay. Take samples for N analysis each year. 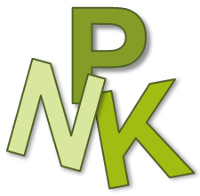 If leaf P, K and micronutrient concentrations are sufficient, further analysis of these nutrients can be done every 4-5 years. Critical nutrient levels for late summer / early fall leaf samples in 'Hass' Avocado (adapted from [N4,N8]). 'Hass' avocados have relatively high leaf N concentrations. Other varieties may have a slightly different optimum range [N7]. Leaf analyses are more useful for assessing the long-term adequacy of the fertilization program than correcting current-year deficiencies, since yield potential is mostly set in the early stages of fruit development [N21,N24]. In addition, leaf N levels often do not correlate well with yields, especially in alternate bearing trees [N24]. Young trees are usually fertilized every 4 to 6 weeks through the growing season, from March to October. Dry or liquid fertilizers can be used [N4]. Recommended N rates for young avocado trees are shown below. When mulch is used initially, it may tie up some of the N, and a little extra should be added to compensate for this [N4]. Continued mulching can be a significant source of N. Nitrate from non- fertilizer sources such as irrigation water or a cover crop should also be taken into account [N32]. Irrigation water can carry a lot of N, especially in many areas along the coast [N12]. 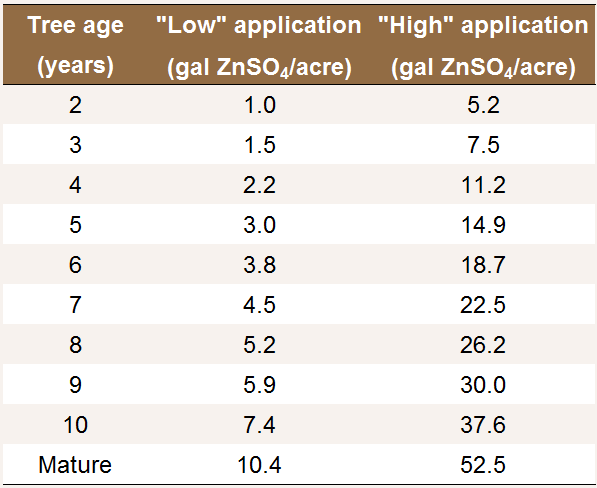 See Soil Applied N: Application Rate for more information. Care should be taken not to overfertilize, as this can cause root burn. Manures or fertilizers shouldn't be added to the planting hole [N4]. Annual and monthly N application rates to young avocados, assuming 8 equal monthly applications [N4]. 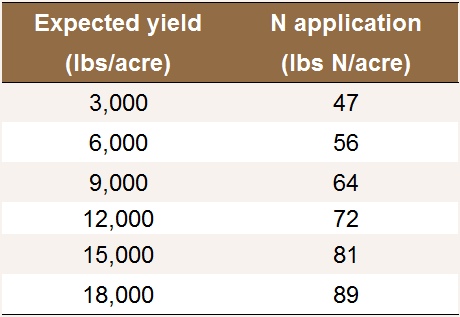 Nitrogen application rate recommendations based on early studies range from about 1 to 2 lbs N/tree, which corresponds to 145-290 lbs N/acre in a 145 tree/acre orchard [N6]. However, with better irrigation efficiency and the ability to "spoon-feed" N to avocado trees at crucial growth stages, optimal N application rates can be significantly reduced [N13] (See Table). Avocados remove about 2.5- 3.5 lbs N/1000 lbs of harvested fruit [N1,N4,N19,N20,N31]. An online fruit removal calculator for 'Hass' avocado can be found here. However, avocados tend to alternate bear, and the fruit can remain on the tree 15-18 months after bloom, meaning that two crops of different sizes and at different stages are often on the tree at once. Applying N based on an average yield, or the yield of the previous year's crop, may overstimulate vegetative growth in "off" years and provide insufficient N in "on" years [N20,N25]. In addition, the N required for canopy growth depends on the crop load as well as the size and age of the trees [N31,N32]. To address this complexity, Richard Rosecrance and Carol Lovatt recently [N32] developed an avocado fertilization model (accessible online here) which uses data from California research trials to determine avocado N requirement based on user-reported tree age, N status, canopy size, and yield expectations for both the new and maturing crop. The model integrates this information with weather data, irrigation volume and estimated N from non-fertilizer sources to give N application rate and timing suggestions. The annual N application rates suggested in the table below need to be adjusted for the previous year's crop remaining on the tree, as well as N from the soil, cover crops, organic fertilizers, and irrigation water, and excess or deficient leaf N concentrations. The model provides a detailed breakdown of N application rates and times. Annual N application rates to avocados fertigated via low volume irrigation. Assumes a non-deficient orchard with a density of 145 trees/acre and a canopy diameter of 20 ft. Expected yield does not include yield from the maturing (previous year's) crop. When well water is used for irrigation, it may contribute a significant amount of N [N12]. Well water samples should be taken after the pump has been run for several hours, to make sure that the water sampled is representative of what the orchard will receive [N29]. Nitrate in well water can be calculated as the ppm of nitrate-N x 2.72 = lbs N applied in one acre foot of water. For example, a test value of 7 ppm nitrate-N in an orchard receiving 4 acre-feet of water per year would mean that 76 lbs N/acre are added annually with the irrigation water. If the concentration of nitrate rather than nitrate-N is given, multiply by 0.614 rather than 2.72. To estimate N credits, only the nitrate-N in the water taken up by the trees, which corresponds to the evapotranspiration (ET) rate, should be counted [N29]. Fertigation is the preferred method for applying N [N4]. The fertilizer should be injected into the irrigation system in the middle third of the irrigation set. For example, in an 18-hour irrigation set, fertilizer is injected from hour 6 through hour 12. This prevents urea and nitrate from moving below the root zone but still ensures that the N is distributed well in the wetting zone and does not remain in the irrigation system [N13]. If an avocado orchard is leached for salinity control, N fertilizer should be applied towards the end of the irrigation set, followed by enough water to clear out the lines and leach the fertilizer into the top eight inches of soil [N4]. Urea and ammonium may be lost through ammonia volatilization, especially when applied to the surface of dry and alkaline soils [N5]. Since fertilizers cannot practically be mechanically incorporated in a mature avocado orchard without damaging the shallow root system [N20], granular fertilizers are broadcast evenly over the wetting zone before an irrigation is scheduled or rain is expected [N16]. A number of mineral N fertilizers are available to growers. Mineral fertilizers contain N in the form of urea, ammonium, nitrate or a mixture of these. These N forms behave differently in the environment. Nitrate is mobile in the soil and can easily be leached below the root zone with irrigation water or rain. Urea is also relatively mobile and is generally quickly converted to ammonium. Ammonium is less mobile, but is generally converted quickly to nitrate by soil microorganisms in warm and moist soils, unless they are water saturated. This process, nitrification, can lower soil pH. The acidifying effect is especially strong when ammonium fertilizers are applied by drip systems as they are concentrated in a small soil volume [N35]. Ammonium sulfate, a strong acidifier, is not used when avocados are grown on acidic soils such as those found on hillsides in San Diego County [N4]. Calcium nitrate, which neutralizes acidity, is a good choice for these soils [N4]. Consult your local farm advisor about appropriate fertilizers for your area. Triple 15 (15-15-15), ammonium nitrate and urea are commonly used granular fertilizers [N4]. A traditional recommendation is that N be fertigated once a month in equal doses over the course of the growing season [N4]. This reduces the risk of nitrate leaching into the groundwater. However, adding more N just before periods of high uptake may increase yields and fruit size [N22]. Avocado trees take up most of their nutrients between full bloom and autumn, and during the following spring [N32]. Very little N is taken up in winter. On-year trees take up more N than off-year trees [N31]. An efficient fertilization program is to apply most N in spring just after full bloom and in mid- to late summer and to adjust fertilizer application rates to crop load (i.e. more applied during "on" years) [N31]. If fertilizer is not applied in irrigation water, about 2/3 of the annual rate may be applied 4-6 weeks prior to bloom, with the remaining third applied in June or split between June and September [N4]. In order to avoid winter flushing, which can lead to frost damage, Ben Faber [N14] recommends that along the coast in Southern California, no N be applied between October 1st and March 1st. Consult your local farm advisor for the appropriate timing for your area. Extra N in April may help reduce alternate bearing [N22]. When the tree has set a heavy crop, an extra N application in August can help protect the fruit from sunburn by stimulating new vegetative growth. This is especially a good idea on trees affected by persea mite, which causes leaf drop [N15]. Trees that have been damaged by fire or frost shouldn't be fertilized until new growth begins to push, which can take 3 to 6 months [N9]. Mature avocado leaves are inefficient at taking up urea because of their thick, waxy cuticle [N4,N30]. However, foliar N application to flowers and young leaves has potential to increase yields and fruit size. Jaganath and Lovatt [N17] applied low-biuret urea (20% N, 0.1% biuret) to an 11-year old orchard of non-deficient 'Hass' avocado trees at a rate of 50 - 54 lbs urea/acre at the "cauliflower" stage of inflorescence. This resulted in an increased cumulative 3-year yield of large fruits compared with a control [N17]. Foliar urea applications are best made when spring flush leaves are about 1/2 to 2/3 fully expanded [N27]. Since high-N trees are less at risk from freeze damage, a spray of 2% urea prior to an anticipated freeze may be useful [N20]. 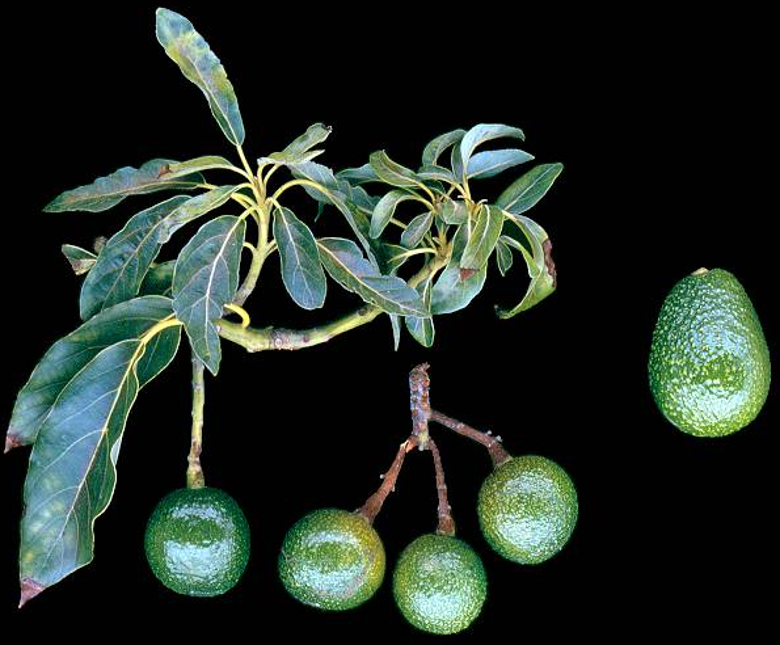 Phosphorus deficiency has rarely been diagnosed in tree fruit crops in California, including avocados [P3]. Trees with P deficiency tend to be stunted, lack vigor and in extreme cases twig dieback can occur. Older leaves may be small, rounded and brownish-green [P11] . The deficiency tends to occur in isolated, random groups of trees rather than in a whole grove [P3]. High phosphorus levels inhibit zinc uptake. Faber [P8] observed Zn deficiency in a Ventura County orchard that had been fertilized with 200 lbs P/acre. Soil samples taken before an orchard is planted provide valuable information about soil conditions, salinity and nutrient availability. While soil nutrient analyses are less useful in orchards than in annual crops and decisions based on leaf analyses, periodic soil check-ups help evaluate the fertilization program [P7]. Avocados are very shallow-rooted trees; however, on well-drained soils roots may reach a depth of over 4 feet [P23]. Soil samples for salinity analysis are taken to at least that depth [P20]. However, as most avocado roots are found in the top two feet of soil [P19,P20], nutrient availability is generally determined to a depth of two feet. For sampling purposes, the orchard should be divided into uniform blocks with respect to soil properties, tree appearance, age, variety, and rootstock. Interpretation of the results is most informative, when samples are taken from the same blocks used for leaf analysis. Samples should always be taken around the same time of the year to better detect long-term trends. The same samples can be used for nutrient and salinity analyses. For more information on sampling procedure see Soil Sampling in Orchards. Phosphorus availability strongly depends on soil pH. In acidic soils, P is immobilized by iron and aluminum minerals, while the predominant mechanism of P immobilization in alkaline soils is the formation of insoluble calcium phosphate compounds. For this reason, the recommended soil test depends on soil pH. For acidic to neutral soil (pH < 7.0), the Bray P1 test is generally used. For neutral and alkaline soils (pH > 6.5), the Olsen method is more appropriate. Using a test that is inappropriate for the soil analyzed may lead to inaccurate interpretation. No University of California optimal soil test values specific to avocado are available. For orchards in general, Fulton [P9] recommended an optimum Olsen-P range of 10-20 ppm and Bray-P1 range of 20-40 ppm (see Table). Interpretation of P and K soil test results in orchards [P9]. When leaf or soil analyses suggest that P fertilization may be beneficial, the application rate can be based on the amount of P removed with harvested fruits (See Soil Applied P). Critical nutrient levels for late summer/ early fall leaf samples in 'Hass' Avocado (adapted from [P3,P6]). Leaf analyses are more useful for assessing the long-term adequacy of the fertilization program than correcting current-year deficiencies, since yield potential is mostly set in the earlier stages of fruit development [P13,P15]. While a leaf P concentration of 0.1-0.25% is considered sufficient, concentrations exceeding 0.14% may already interfere with zinc uptake [P5,P11]. There are no University of California recommendations for fertilizer P to young avocado trees, and P fertilization is not common. There are currently no University of California recommendations for P fertilization of avocado orchards. Soil and leaf analyses can be used to monitor the P status of an orchard over the years to ensure that P availability is adequate (See Soil P Test and Leaf P Analysis ). In non-deficient orchards fertilizer rates may be based on crop removal. For California 'Hass' avocados, about 1 lb of P (2.4 lbs of P2O5) is removed with each 1,000 lbs of fruit harvested [P1,P21]. An online fruit removal calculator for 'Hass' avocado can be found here. For example, replacing P removed with 10,000 lbs of fruit would require 24 lbs P2O5/acre (3.3 gallons phosphoric acid at 7.3 lbs P2O5/gallon). This rate may be adjusted based on leaf tissue and soil analyses. Fertigation of 5 gallons of phosphoric acid/acre, followed by an annual application of 3 gallons/acre, has been observed to correct P deficiency [P3]. If dry fertilizer is used, 2.5 lbs P2O5/tree should correct P deficiency for 3 to 5 years [P3]. However, rates this high may interfere with Zn uptake, and should be used with caution [P8]. Soil-applied P fertilizer can be fertigated as liquid phosphoric acid, or banded as dry fertilizer within the wetting zone [P3]. Care must be taken when P is fertigated. Phosphorus sources may precipitate as calcium or magnesium phosphates and clog emitters. The formation of precipitates may be minimized when the water pH is lowered to 4.0 - 4.5 with sulfuric or phosphoric acid. Phosphorus is quickly immobilized on soil mineral surfaces and does not move far into the profile [P24]. However, because avocados have a shallow root system it is not practical to incorporate granular fertilizers, and they are usually banded on the surface within the wetting zone. Concentrated surface bands can increase P availability by saturating the soil's immobilization capacity. This is especially important on acid or calcareous soils, which tend to immobilize P [P11]. Phosphoric acid (0-54-0) is the most commonly used fertilizer for fertigation. However, phosphoric acid should be used only when the combined Ca and Mg concentration of the water is below 50 ppm and the bicarbonate level is less than 150 ppm, to avoid forming precipitates which clog the emitters [P4]. Zinc and P fertilizers should never be fertigated together, as zinc phosphates may precipitate out and clog emitters. Products containing phosphorous acid and phosphite, although normally used as fungicides, are labelled as P fertilizers and have been demonstrated to contribute to P nutrition [P3,P12]. However, the P is only slowly available [P3], and the rates used are so low that it is not considered valuable as a fertilizer (Ben Faber, personal communiction). Numerous other products may be used. Fact sheets of the most common fertilizers can be found on the web site of the International Plant Nutrition Institute. In a trial in a mature commercial 'Hass' orchard in Ventura County, Dr. Carol Lovatt [P14] observed that July and August were the best time to apply P and K. This may have been because applications in July reduced competition between the development of the current year's summer flush and the fruit from last spring's bloom, while applications in August provided resources for the fast growth of the current year's crop and the initiation of next spring's inflorescences [P14]. In a typical well-managed orchard on a moderately fertile soil, P rarely if ever needs to be applied [P22]. Targeted applications of foliar P to avocado flowers may increase yields, especially in "off" years. Mature 'Hass' avocado trees in a commercial orchard in Ventura County were sprayed with potassium phosphite (0-28-26; 1.6 lbs P2O5/acre; 1.6 lbs K2O/acre) in March, at the 'cauliflower' stage of inflorescence development, and yields were tracked for three years. Foliar phosphite significantly increased the yield of large fruits in the off-year, and tended to increase the total yield and number of large fruits per tree in each year for three crop years. Yields for the three years were increased by an average of 38.8 lbs of fruit per tree compared to a control in which potassium phosphate was applied to the soil [P16]. Phosphite is better absorbed into avocado tissues than phosphate [P17], and foliar sprays of potassium phosphite are also used to help control Phytophthera root rot [P18]. However, phosphite fertilizers have the potential to be toxic to plant tissues and so should be used with care [P17]. Potassium deficiency symptoms on the leaves include tip burn, tissue death along the margins and brownish-red necrotic spots between the veins on mature leaves. Growth is slow, twigs may be thin and dieback may occur [K2,K9]. 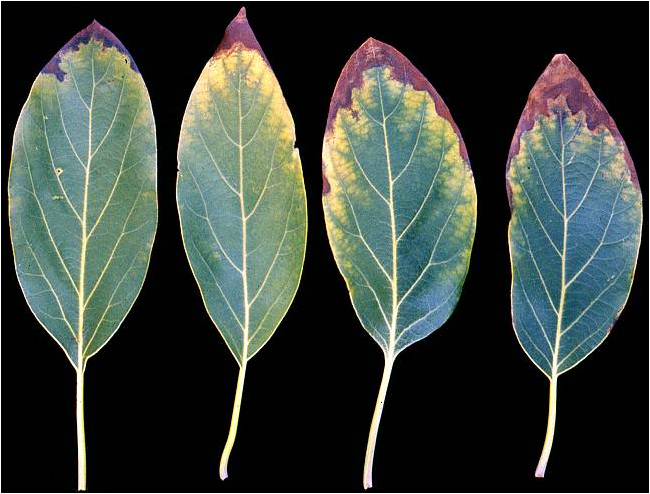 Leaf symptoms are similar to those seen under chloride and sodium toxicities, which are more common in California [K2]. K deficiency in avocado leaf. Photo by Bob Platt, courtesty of Avocado Source. Soil samples taken before an orchard is planted provide valuable information about soil conditions, salinity and nutrient availability. However, while soil nutrient analyses are less useful in orchards than in annual crops, and decisions are generally based on leaf analyses, periodic check-ups help evaluate the fertilization program [K4]. Avocado roots on well-drained soils may reach a depth of over 4 feet [K18], so soil samples for salinity analysis are taken to a depth of 4 feet or more [K16]. However, as most avocado roots are found in the top two feet of soil [K15,K16], nutrient availability is generally determined to a depth of two feet. The ammonium acetate extraction method is the most common method to determine soil K availability. No University of California optimal soil test value specific to avocado is available. 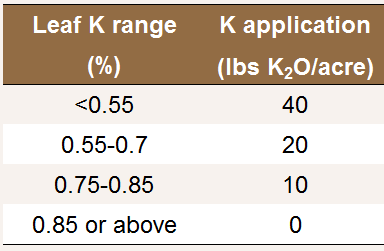 For orchards in general, Fulton [K8] recommended an optimum extractable K range of 150- 250 ppm (see Table). When soil or leaf analyses suggest that K fertilization may be beneficial, the application rate can be based on the amount of K removed with harvested fruits each year (See Soil Applied K). Since sodium inhibits K uptake, higher soil K concentrations may be beneficial in salt-affected soils [K7]. Critical nutrient levels for late summer/ early fall leaf samples in 'Hass' Avocado (adapted from [K2,K3]). Leaf analyses are more useful for assessing the long-term adequacy of the fertilization program than correcting current-year deficiencies, since yield potential is mostly set in the earlier stages of fruit development [K12,K14]. For young nonbearing trees, the Avocado Fertilization Model suggests the following application rates. K application rate to young non-bearing avocado. Assumes a tree density of 145 trees/acre and no organic amendments. (Adapted from Avocado Fertilization Model). When trees begin to bear, K fertilizer may be applied to replace the K removed with the fruits. See Soil Applied K for more details. Avocado K requirements are under-researched in California. A large amount of K is removed in the fruits, and the little research which exists suggests that potassium fertilization is required for good yields in the long term [K2]. Leaf and soil analyses should be used to monitor the K status of an orchard and to plan K applications (See Soil K Test and Tissue K Analysis). Fertilizer rates may be based on crop removal. Avocados remove about 7.2- 8.4 lbs of K2O (6-7 lbs of K) for each 1,000 lbs of harvested fruit [K1,K2,K10,K17]. An online fruit removal calculator for 'Hass' avocado can be found here. For example, replacing K removed with 10,000 lbs of fruit would require about 144-168 lbs K2SO4 (0-0-50). This rate may be adjusted based on leaf tissue and soil analyses. A higher rate is applied to deficient trees. However, while a large amount of K is removed with the avocados at harvest, avocados do not reliably respond to K fertilization. It appears that once a minimum requirement is met additional K does not increase yield or fruit size [K10]. Composts and manures also contribute some K, which should be deducted from the total rate. If two crops are on the tree, both should be fertilized. An online K fertilization model can be accessed here. Potassium is normally applied by fertigation. This is the preferred method, as it saves labor cost of spreading and is more efficient, allowing less fertilizer to be used. Dry fertilizer may be banded within the wetting zone. Very little research has been done to determine the best method of dry K application. SLimaco Sing and McNeil [K11] found that banding 5 - 10 lbs of K2SO4 under the dripline of each tree raised leaf K concentrations of a 4-year old avocado orchard on a serpentinite soil with a history of K deficiency. Broadcasting is not recommended, especially on soils which fix K.
Potassium sulfate, potassium chloride, potassium thiosulfate and potassium nitrate are common materials. Fact sheets of the most common fertilizers can be found on the web site of the International Plant Nutrition Institute. Potassium chloride (KCl) should be used with caution, especially on saline soils or where irrigation water is high in chloride [K10]. A leaf Cl- concentration of 0.25-0.50 ppm indicates Cl - toxicity [K9], and KCl should not be used. Cl- toxicity on 'Hass' avocado. Photo by Bob Platt, courtesy of Avocado Source. Since K does not usually leach from the soil and doesn't stimulate winter flushes, timing of application is generally not thought to be important [K5]. However, an experiment by Lovatt [K13] found that P and K applied in July and August improved fruit yield and number of fruits per tree in a mature commercial Hass orchard in Ventura County more than when applied in April, November, or in all four months. July is a time of rapid N and K uptake by last year's crop, and dropping of some of the current year's fruit ("June drop"), as well as the development of the summer vegetative flush. In August the current fruits grow exponentially, mature fruits abscise and next year's inflorescences are initiated [K13]. Avocado is sensitive to chloride. If potassium chloride (KCl) fertilizer is used, applying KCl in the wetter months of the year is a good strategy, since Cl- is more mobile than K in soil and can be leached out by winter rains in a normal winter [K6]. There is evidence that avocado leaves can take up K; however, soil applications may be more effective. Limaco Sing and McNeil [K11] found that when 'Hass' avocados growing on a K-limited California soil were sprayed with a 3.6% potassium nitrate solution (30 lbs KNO3/100 gallons water) at about 261 gallons/acre, leaf K concentration increased compared with an unfertilized control. However, banded K2SO4 gave similar results and was more cost effective. Leaf burn may occur at concentrations exceeding 30 lbs KNO3/100 gallons water [K11]. 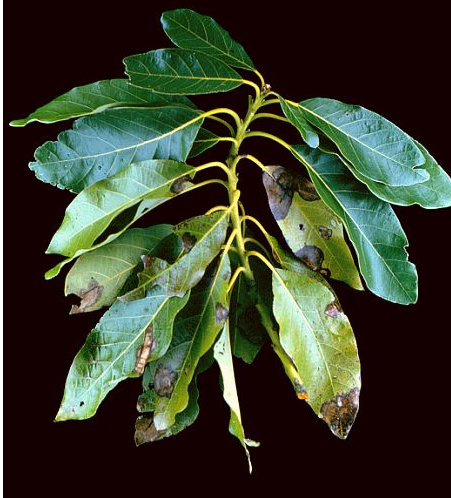 Zinc deficiency is characterized by "little-leaf" - small, mottled, narrow leaves on the terminal branches. Leaves may be light green or yellowish. In severe deficiencies the internodes may be shortened. Fruits tend to be smaller and roundish [Zn11]. Zinc deficiency occurs on both acid and calcareous soils. Zinc deficiency may also be associated with excessive P applications [Zn8] and Phytophthera root rot. Orchards located on calcareous soils will often show strong deficiencies in a few small areas [Zn3]. Narrow, mottled leaves and round fruits in Zn-deficient 'Hass' avocado. Photo by Bob Platt, courtesy of Avocado Source. The Zn status in orchards is most often assessed with leaf analyses. In soil, DTPA extractable Zn concentrations of 0.7-1.5 ppm are generally considered adequate. Concentrations below 0.7 ppm indicate low availability, while concentrations exceeding 1.5 ppm are considered high [Zn2]. However, in calcareous soils avocado Zn deficiency is due to a plant physiological response to high concentrations of bicarbonate, rather than the amount of available Zn. In these soils extractable soil Zn does not predict Zn deficiency [Zn3]. In orchards, leaf analyses are more reliable for the diagnosis of nutrient deficiencies and the evaluation of fertilization programs than soil analyses. Critical nutrient levels for late summer/ early fall leaf samples in 'Hass' Avocado (adapted from [Zn1,Zn6]). Leaf analyses are more useful for assessing the long-term adequacy of the fertilization program than correcting current-year deficiencies, since yield potential is mostly set in the earlier stages of fruit development [Zn12,Zn13]. Non-deficient trees should not be fertilized. Historically many growers have applied Zn on a schedule regardless of tree need, and this may over time lead to Zn buildup and toxicity [Zn1,Zn4]. Avocado root rot (Phytophthera cinnamomi) kills root hairs, sometimes resulting in Zn deficiency. If root rot is present, addressing it will be a better long-term solution than applying Zn fertilizer to correct the deficiency [Zn7]. The same is true for deficiencies caused by high bicarbonate concentrations on calcareous soils. See Soil Applied Zn for more details. In young trees, Zn is usually fertigated as liquid zinc sulfate (ZnSO4; 12% Zn). It may also be banded as dry fertilizer (ZnSO4; 36% Zn) or applied foliarly (See Foliar Zn). Bender [Zn1] recommends the following rates to correct deficiency in young avocado trees. The higher rates should be used with more severe deficiencies. Recommended fertigated zinc sulfate (12%) application rates to young trees. "Low" and "High" rates represent 10 and 50 lbs Zn/acre to mature trees in a 145 tree/acre orchard, respectively [Zn1]. If solid ZnSO4 is used, a rate of 0.7 lbs fertilizer/tree is recommended in the second year, 1 lb fertilizer/tree in the third, and an additional 0.5 lbs for each subsequent year until maturity. A single application of dry fertilizer can correct the deficiency for 3 to 5 years. Additional applications should not be made unless leaf Zn is low. When Zn is banded it is a good idea to test an application rate on a few trees first, since too much Zn may injure trees and the correct amount depends on soil type [Zn9]. 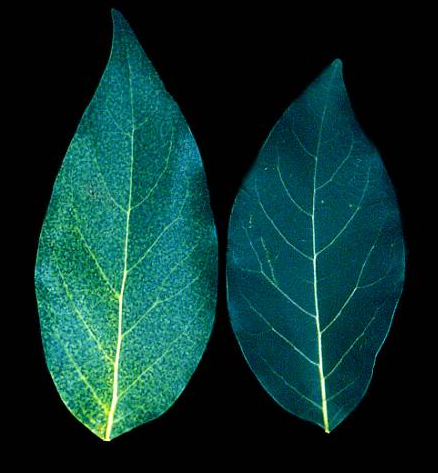 Most foliar-applied Zn remains in the sprayed leaves and is not translocated to the rest of the tree [Zn4,Zn5]. Unless the only concern is correcting deficiency in the outer canopy, soil application is more effective. If foliar application is used, it is best done on new leaf tissue [Zn5]. A spray of 3-4 lbs/acre ZnSO4 (1 lb ZnSO4 /100 gallons water) is recommended for young trees, and 6-8 lbs for mature orchards [Zn9]. Fertigating 10 - 50 lbs Zn/acre is usually adequate to correct Zn deficiencies that are not associated with highly calcareous 'hot spots' [Zn1] . As a general starting level for fertilization for Zn-deficient trees, Crowley and coworkers [Zn4] suggest fertigating 3.5 oz of Zn per tree, equivalent to 22.4 gallons liquid ZnSO4 (12% Zn) per acre for a 145 tree/acre orchard. This is equivalent to about 32 lbs Zn/acre. This amount can be adjusted based on late August-early September leaf samples. More fertilizer is required if it is surface banded [Zn9]. Traditionally, 7 lbs of solid ZnSO4 (36% Zn) per tree is used to correct deficiencies on mature avocados. This should last for 3- 5 years [Zn1]. When Zn is banded it is a good idea to test an application rate on a few trees first, since too much Zn may injure trees and the correct amount depends on soil type [Zn9]. Liquid ZnSO4 may be fertigated [Zn5]. Solid ZnSO4 may be banded in the wetted zone of the canopies of deficient trees. Fertigation is less expensive and considered less risky. It is preferred, except for spot-treatment of deficient trees [Zn4]. Zinc and P fertilizers should never be fertigated together, as zinc phosphates may precipitate out and clog emitters. Zn-EDTA is not effective on avocados [Zn5]. Zinc is best applied in spring and early summer, during the period of new root growth, when Zn uptake is highest [Zn4]. Often Zn deficiencies are induced by patches of bicarbonate accumulation. Based on experiments with a 'Hass' avocado orchard on a calcareous soil in Ventura County, Crowley and Smith [Zn3] suggest that these deficiencies are better treated by reducing soil bicarbonate than by adding Zn fertilizer. Often carbonates build up in poorly drained or over-irrigated areas, in which case improving drainage is key. In sodium-affected soils, application of gypsum can help improve soil drainage. Using acidic fertilizers or acidifying the irrigation water may also be useful [Zn3]. In practice these "hot spots" are difficult to correct, and it may be most economical to accept these deficiencies [Zn4]. Arpaia, M.L., 2005. Avocado postharvest quality: An overview. Presented to the New Zealand and Australia Avocado Grower's Conferences 2005. 20- 22 September, Tauranga, New Zealand. Arpaia, M.L., Meyer, J.L., Witney, G.W., Bender, G.S., Stottlemyer, D.S., Robinson, P.R., 1996. The Cashin Creek nitrogen fertilizer trial: What did we learn? California Avocado Society 1996 Yearbook 80, 85-98. Bender, G., 2013. Fertilization. In: Bender, G., (Ed.). Avocado production in California: A cultural handbook for growers, Book 2: Cultural Care. (2nd ed.). The University of California Cooperative Extension, San Diego County and The California Avocado Society. pp. 29-54. Cantarella, H., Mattos Jr., D., Quaggio, J.A., Rigolin, A.T., 2003. Fruit yield of Valencia sweet orange fertilized with different N sources and the loss of applied N. Nutrient Cycling in Agroecosystems 67, 215-223. Embleton, T.W., Jones, W.W., 1964. Avocado nutrition in California. Reprinted from Vol. 77 of the Proceedings of the Florida State Horticultural Society, Miami, November 3- 6, 1964. Embleton, T.W., Jones, W.W., Garber, M.J., 1960. Leaf analysis as a guide to nitrogen fertilization of the avocado. California Agriculture 14, 12-12. Faber, 2006. Living with fire. Faber, B., 2007. Leaf analysis. Topics in Subtropics 5, 2. Faber, B., 2013a. Cultural practices to reduce pest and disease in avocado and citrus. Topics in Subtropics 11, 2-3. Faber, B., 2013b. Learn to read your water report. Faber, B., 2013c. Microirrigation, fertilizers and clogging. Faber, B., 2014. When to fertilize avocado and citrus in California. Faber, B., 2015. Wow,there are so many avocados on my tree! Should I apply nitrogen at this time? Goodall, G.E., Embleton, T.W., Platt, R.G., 1978. Avocado fertilization. UC Division of Agricultural Sciences, Leaflet 2024. Jaganath, I., Lovatt, C.J., 1996. Efficacy studies on prebloom canopy applications of boron and/ or urea to 'Hass' avocados in California. 1996 Avocado Research Symposium, p. 51- 54. Jones, W.W., Embleton, T.W., 1976. Leaf analysis as a guide to avocado fertilization. In: Reisenauer, H.M. (Ed.). Soil and Plant-Tissue Testing in California. University of California Cooperative Extension Bulletin 1879. pp. 10. Lahav, E., Kadman, A., 1980. Avocado Fertilisation. International Potash Institute, Bern, Switzerland. Lahav, E., Whiley, A.W., Turner, D.W., 2013. Irrigation and mineral nutrition. In: Schaffer, B., Wolstenholme, B.N., Whiley, A.W., (Eds.). The Avocado: Botany, Production and Uses (2nd ed.). CAB International, Boston, MA. pp. 301-341. Lovatt, C.J., 1999. Timing citrus and avocado foliar nutrient applications to increase fruit set and size. HortTechnology 9, 607-612. Lovatt, C.J., 2001. Properly timed soil-applied nitrogen fertilizer increases yield and fruit size of 'Hass' avocado. Journal of the American Society for Horticultural Science 126, 555-559. Lovatt, C.J., 2008. Increasing yield of 'Hass' avocado by adding P and K to properly timed soil N applications. FREP final report. Lovatt, C.J., 2010. Alternate bearing of 'Hass' avocado. California Avocado Society 2010 Yearbook 93, 125-140. Lovatt, C., 2015. Fertilizing the 'Hass' avocado for maximum profitability. Lovatt, C.J., Faber, B., Rosecrance, R., 2010. Can a better tool for assessing 'Hass' avocado tree nutritional status be developed? : A feasibility study. FREP final report. Lovatt, C.J., Witney, G., 2001. Nitrogen fertilization of the 'Hass' avocado in California. AvoResearch 1, 3. Meyer, J.L., Yates, M.V., Stottlemyer, D.E., Takele, E., Arpaia, M.L., Bender, G.S., Witney, G.W., 1992.Irrigation and fertilization management of avocados. Proceedings of the Second World Avocado Congress 1992. pp. 281-288. Nevin, J.M., Lovatt, C.J., 1990. Problems with urea-N foliar fertilization of avocado. 1990 Summary of Avocado Research, p. 15-16. Rosecrance, R., Lovatt, C.J., 2004. Seasonal patterns of nutrient uptake and partitioning as a function of crop load of 'Hass' avocado. FREP final report. Rosecrance, R., Lovatt, C.J., 2013. Management tools for fertilization of the 'Hass' avocado. FREP final report. Salazar-Garcia, S., Cortes-Flores, J.I., 1986. Root distribution of mature avocado trees growing in soils of different texture. California Avocado Society 1986 Yearbook 70, 165-174. Witney, G., Arpaia, M.L., 1991. Tree recovery after the December 1990 freeze. California Avocado Society 1991 Yearbook 75, 63-70. Zasoski, R.J., 1994. Nitrogen efficiency in drip irrigated almonds. FREP Final Report. Bender, G.S., 2005. Phosphorous acid in avocado production: Should it be a cultural recommendation? Topics in Subtropics 3, 1-3. Boman, B., Obreza, T., 2002. Fertigation nutrient sources and application considerations for citrus. University of Florida IFAS Extension, Circular 1410. Faber, B., 2014. Zinc and phosphorus. Topics in Subtropics 12, 5-6. Lovatt, C.J., 1990. A definitive test to determine whether phosphite fertilization can replace phosphate fertilization to supply P in the metabolism of 'Hass' on 'Duke 7'. California Avocado Society 1990 Yearbook 74, 61-64. Lovatt, C.J., 2013. Properly timing foliar-applied fertilizer increases efficacy: A review and update on timing foliar nutrient applications to citrus and avocado. HortTechnology 23, 536-541. Lovatt, C.J., Mikkelsen, R.L., 2006. Phosphite fertilizers: What are they? Can you use them? What can they do? Better Crops 90, 11- 13. Marais, L.J., Menge, J.A., Bender, G.S., Faber, B., 2002. Alternate bearing of 'Hass' avocado. AvoResearch 2, 1-4. Meyer, J.L., Yates, M.V., Stottlemyer, D.E., Takele, E., Arpaia, M.L., Bender, G.S., … Witney, G.W., 1992. Irrigation and fertilization management of avocados. Proceedings of the Second World Avocado Congress 1992. pp. 281-288. Oster, J.D., Stottlemyer, D.E., Arpaia, M.L., 2007. Salinity and water effects on 'Hass' avocado yields. Journal of the American Society for Horticultural Sciences 132, 253-261. Faber, B., 2015a. Putting fertilizer chloride in perspective. Faber, B., 2015b. Salt, sodium and potassium and drought. Lahav, E., Whiley, A.W., Turner, D.W., 2013. Irrigation and mineral nutrition. In: Schaffer, B., Wolstenholme, B.N., Whiley, A.W., (Eds.).(2013). The Avocado: Botany, Production and Uses (2nd ed.). CAB International, Boston, MA. pp. 301-341. Limaco Sing, J., McNeil, R.J., 1992. The effectiveness of foliar potassium nitrate sprays on the 'Hass' avocado (Persea americana Mill.). Proceedings of the Second World Avocado Congress 1992. pp. 337-342. Meyer, J.L., Yates, M.V., Stottlemyer, D.E., Takele, E., Arpaia, M.L., Bender, G.S., ... Witney, G.W., 1992. Irrigation and fertilization management of avocados. Proceedings of the Second World Avocado Congress 1992. pp. 281-288. Crowley, D.E., Smith, W., 1995. Soil factors associated with Zn deficiency in avocado. California Avocado Society 1995 Yearbook 79, 171-183. Crowley, D.E., Smith, W., Faber, B., Arpaia, M.L., 2001. Trace metal nutrition of avocado. AvoResearch 1, October 2001. Crowley, D.E., Smith, W., Faber, B., Manthey, J.A., 1996. Zinc fertilization of avocado trees. HortScience 31, 224-229.